While we haven’t yet traveled with Oscar by airplane, he has traveled with us in the car many times. Oscar likes to visit his grandma who lives about three hours away, so that’s our most common trip. However, we also let him ride along with us if we are running quick errands where we don’t need to get out of the car. We enjoy having him with us, so we always look for opportunities when Oscar can ride in the car. 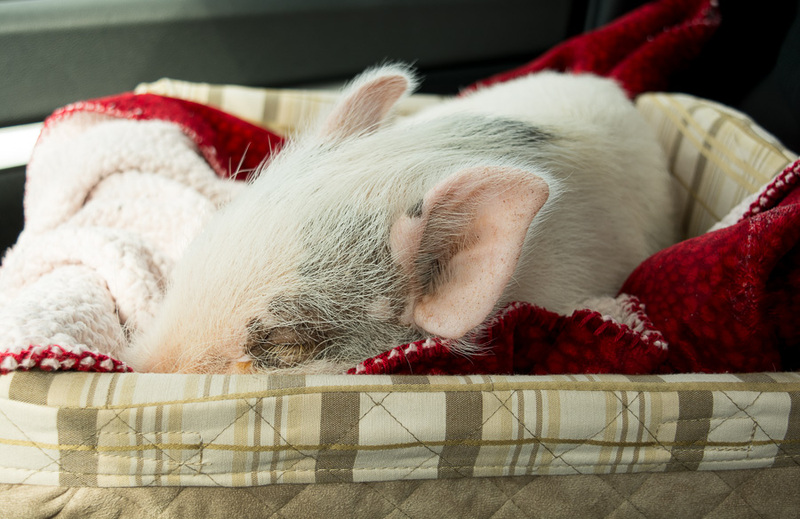 Even if you don’t plan on traveling with your mini pig for fun, training her to be comfortable in the car is important for getting your pig to the veterinarian. Of course it’s useful for normal vet checkups, but it’s especially important for emergency situations. If you ever need to get your pig to the vet quickly, you don’t want to add stress by putting him in a new situation. Also, it takes time to figure out how to get your pig into the car, where to have him sit, and how to secure him. It’s definitely a process, and it’s incredibly useful to have everything planned out before you actually have to travel with a mini pig. The first few times we put Oscar in the car for a trip to grandma’s house, it took a long time. Where will we put him? Should he sit on the seat or in a lap? Wait, he’ll probably want a blanket…let’s grab one for him. Will he need water along the way? Is he comfortable enough? An hour or so later, we were ready to get on the road. These days, we have it all down. I can grab everything I need for Oscar’s trip in the car, get it set up, and have him buckled in and ready to go in just a few minutes. Since he’s used to the routine, he cooperates and sits calmly in his seat once he’s in the car. It makes trips with him so much easier, and we’re more inclined to take him places with us because we have a system that’s quick. Before discussing how we travel in the car with Oscar, it’s necessary to point out that not all mini pigs travel well. 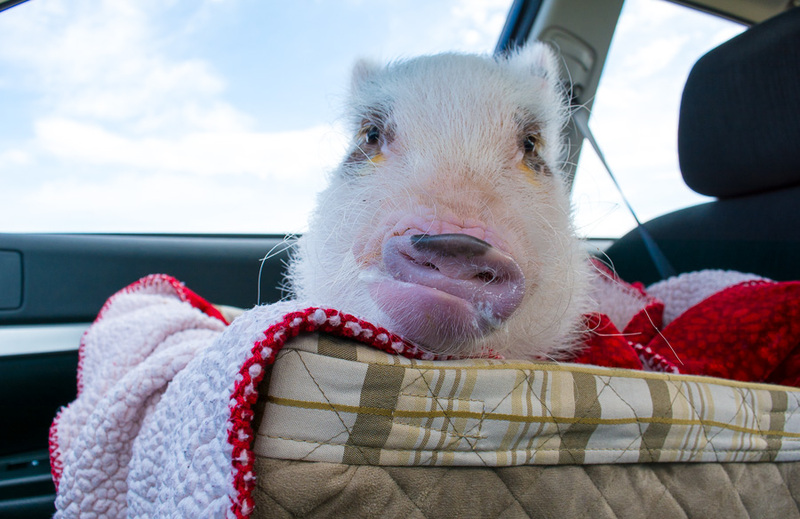 Oscar is calm and happy in the car, but not all pigs enjoy traveling. There’s no polite way to put this, but some pigs are nervous poopers in cars. I know of many pigs who love riding in cars and also many who are nervous poopers, so be prepared for either if you plan on traveling with a mini pig. 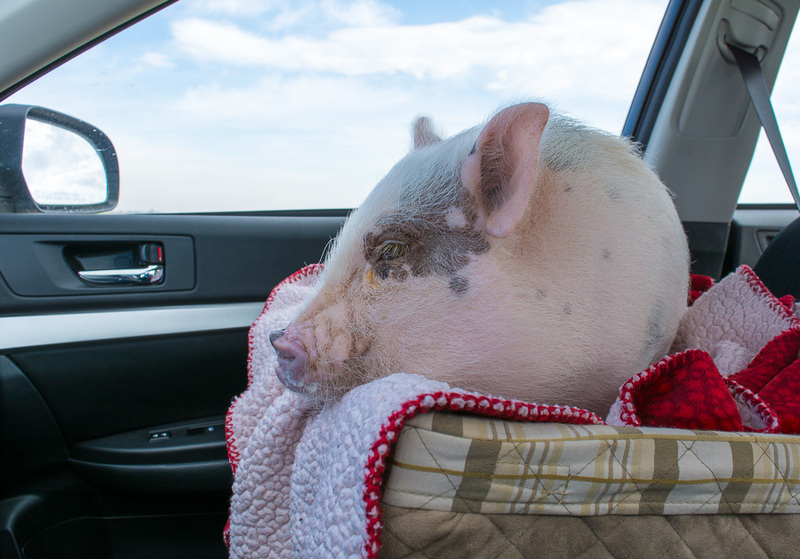 The first time you travel with your pig, take precautions until you know how your pig handles being in the car. Oscar’s very first car ride was on the way home from the breeder, and we put a crate in the car and lined it with puppy pads. We ended up not needing it, but we were prepared in case the ride home didn’t go well. We have two different scenarios for Oscar’s car rides depending on if I’m driving by myself or if my husband is also in the car. When my husband and I are both in the car, Oscar simply rides in the passenger’s lap. Oscar basically considers this cuddle time, and he settles in just like he would on the sofa in the evening. Once he’s in the car, he’s cuddled up and asleep within a few minutes. He wakes up and grunts every once in a while, but otherwise he sleeps for the entire car ride. We bring a blanket along so that he we can cover him up and keep him warm in the car, and he’s a happy little traveler. Traveling with Oscar by myself is a little more challenging but still pretty simple. When he was a baby and his crate was small enough that I could carry him around in it, I put his crate in the passenger seat and Oscar rode in there. A blanket in his crate helped keep him from sliding around while the car was moving. Now that Oscar’s crate is bigger and doesn’t fit in the seat as well, he sits in his pet booster seat . We originally bought our pet booster seat for Rylee a few years ago when we moved and had a long car ride with her; she likes to jump around in the car and we wanted her hooked in one spot but still able to see out the window. It worked well for Rylee, but I wasn’t sure if Oscar would like it. I put the booster seat in the car one day with a warm blanket on top and sat Oscar in it, and he sat still the entire car ride. He was still close to me in the passenger seat, so I could pet him without him trying to get in my lap. I don’t let Oscar ride in my lap while I’m driving for safety reasons, so the booster seat is a perfect compromise. He’s out of my lap, but still close enough I can pet him and see him as we ride along. is the one we use for Oscar, and we love it. Oscar is 28 pounds in these pictures, and he still fits comfortably and can turn around and nap in his jumbo booster seat. Although some pigs don’t travel as easily as Oscar, I still recommend getting a system down for traveling with your mini pig. If you have an emergency and need to move quickly, it’s extremely helpful to know exactly what you need and what setup works for you and your pig when traveling. 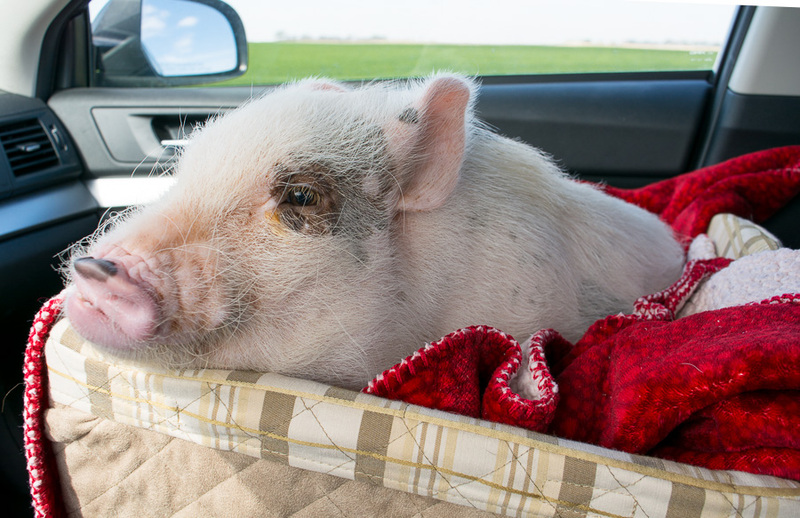 If you can, I recommend trying a few car rides when your pig is young to help her adjust to being in a car as this can get more difficult when your pig is bigger. 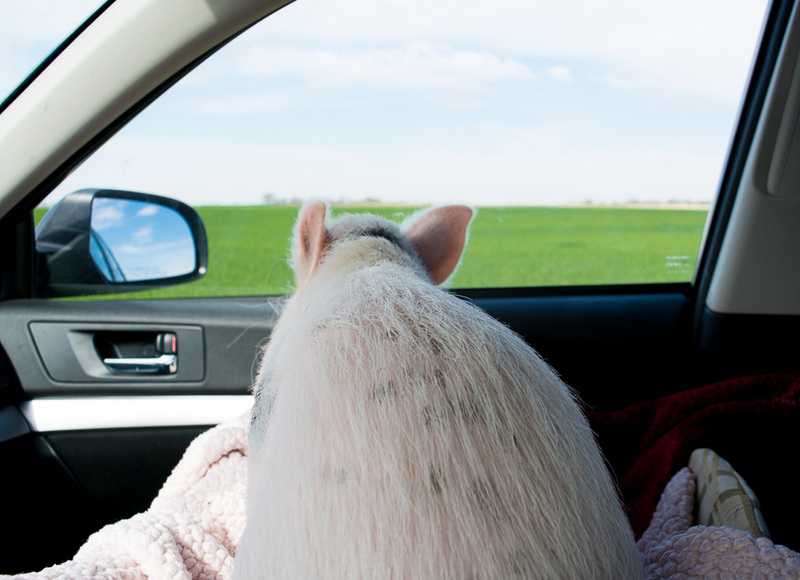 If your pig is comfortable traveling, car rides can be a fun experience for both you and your pig. If you are planning on crossing state lines with your mini pig, there are USDA guidelines you need to follow since miniature pigs are classified as swine. We haven’t crossed state lines with Oscar, so I’m not experienced in this area yet. However, here are some links to other websites with helpful information on what you need to travel across state lines with your mini pig. Update: After writing this post, we took Oscar on his first out-of-state trip, and he got car sick for the first time. You can read about his car sickness in this post. Haha…I don’t think anyone has ever noticed him in the car, but that would be hilarious! I’m going to have to start paying more attention to see if anyone notices he’s there. I’m sure I would get some surprised looks! 🙂 That’s awesome that you have a vet in your area that does house calls. I have heard of that before but haven’t seen one in our area. It’s not so bad now when he’s small since I can still carry him, but I’m always worried about dogs in the waiting room that might not react well to pigs. Our vet does a good job of trying to take note of when we’re coming in for a visit so that we don’t have that problem, but they can’t control everything of course. Having the option for house calls would be really nice. We’ve really lucked out with Oscar’s behavior in the car, so I wonder what Elmer would think. Seems like some pigs are completely fine and others just don’t do well…not much of an in between. We have some country areas where we could test driving around with him, and that helped a ton so that we weren’t just in town with a lot of cars around while he was adjusting.